Seattle, Wash. has a long legacy of rock bands, and Pearl Jam were undoubtedly one of the most influential and commercially successful of them to hail from The Emerald City. In fact, Pearl Jam’s 1991 debut album, Ten, actually outsold Nirvana’s Nevermind in America. 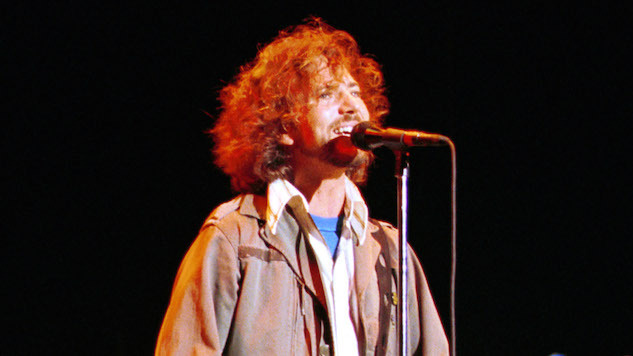 The grunge rockers, marked by the distinct low howl of frontman Eddie Vedder, eventually became one of the most popular rock bands of the ’90s, and their legion of devoted fans remains. On this day in 1992, Pearl Jam performed at the Trocadero Theatre in Philadelphia, Pa. during their Ten tour—the band’s first full-scale world tour. The band performed Ten classics like “Jeremy,” “Even Flow” and “Alive,” which you can watch below. Ten didn’t catch fire immediately, but just a year later, it reached number two on the Billboard 200 chart and remains their most popular album to date, as it achieved Platinum status 13 times. The album was instrumental in popularizing alternative rock in the American mainstream, particularly through radio play and with their music videos plastered all over MTV. Click here to read Aaron Paul’s (Breaking Bad, Bojack Horseman) tribute to the first record he owned—Pearl Jam’s Ten. Watch Pearl Jam perform live in Philadelphia on this day in 1992 below.